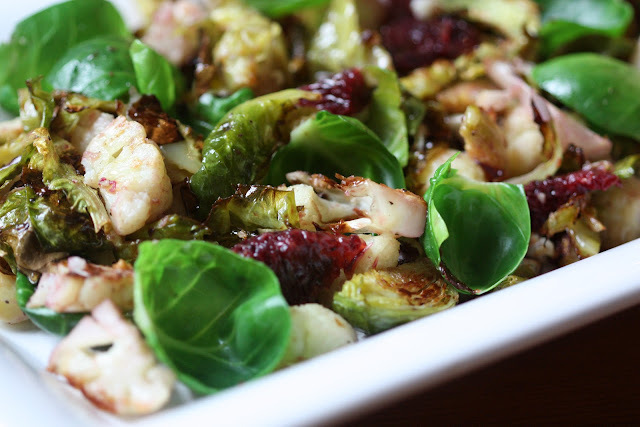 I made peace with brussel sprouts a few years ago when I agreed to try some that had been roasted with parmesan cheese and mixed with bits of crispy bacon. 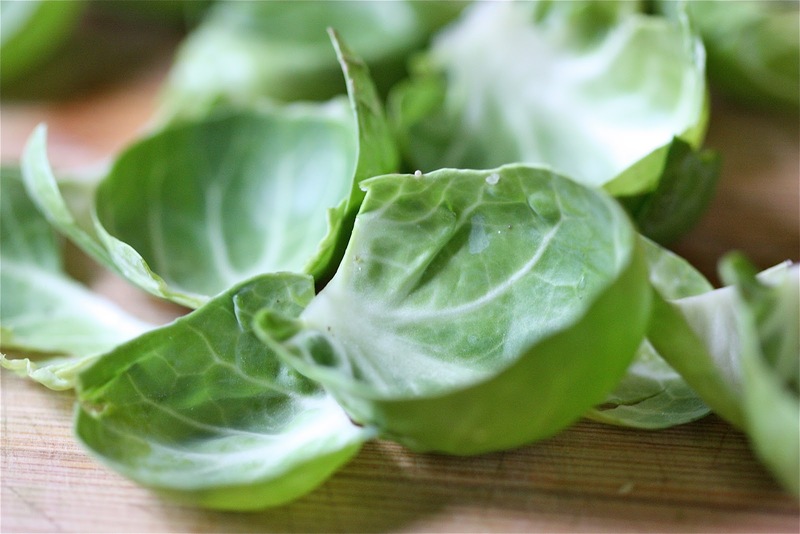 It was a bit of an epiphany at the time, as I had happily written off this mini member of the cruciferous family of cabbage, broccoli, and the like. Most of what I made within this lot was simply chopped fresh or lightly steamed. 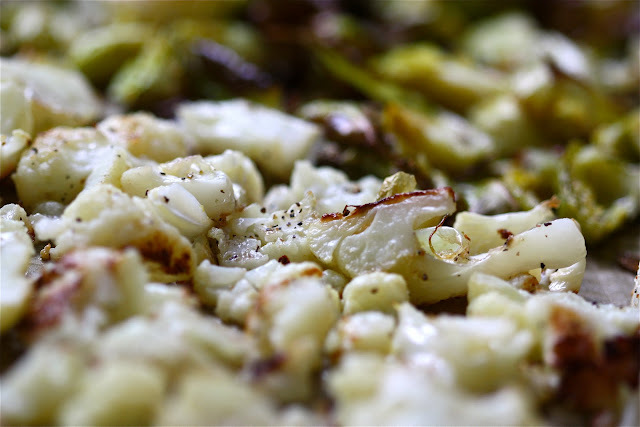 And, brussel sprouts rarely made the cut... until I discovered the wonders of roasting. So, recently, when the roasted brussel sprouts and cauliflower salad at a local restaurant was touted as being "simply delicious," I reserved my skepticism of the accolade and agreed to share a plate. 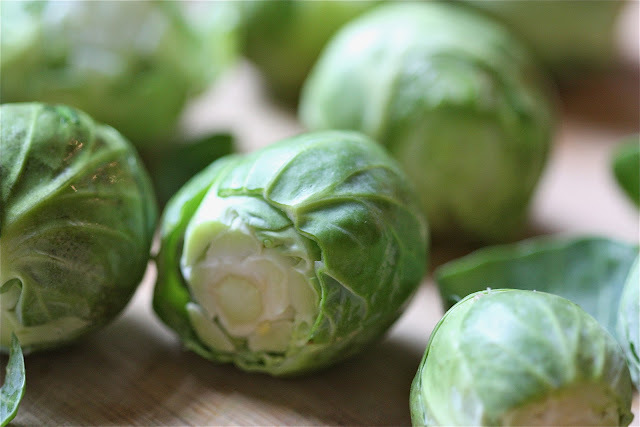 Perhaps they were "good," but "simply delicious" (for brussel sprouts?) was likely, I assumed, a misnomer... a bit of an overzealous sell. What I learned, however, was that simply delicious is just a more refined way of saying crazy good. The sprouts and cauliflower are brilliantly roasted and golden tinged after just 15 minutes or so. And the bits of leaves that break loose char just enough to give the salad a powerful little pop of added flavor. Together with the bright-hued leaves that are blanched and added in with bits of fresh blood orange, the salad is quite good even undressed. I think, however, that it is the salty-sweet zap of the tamari-blood orange vinaigrette that takes this salad from good to really good... from simply delicious to crazy good. 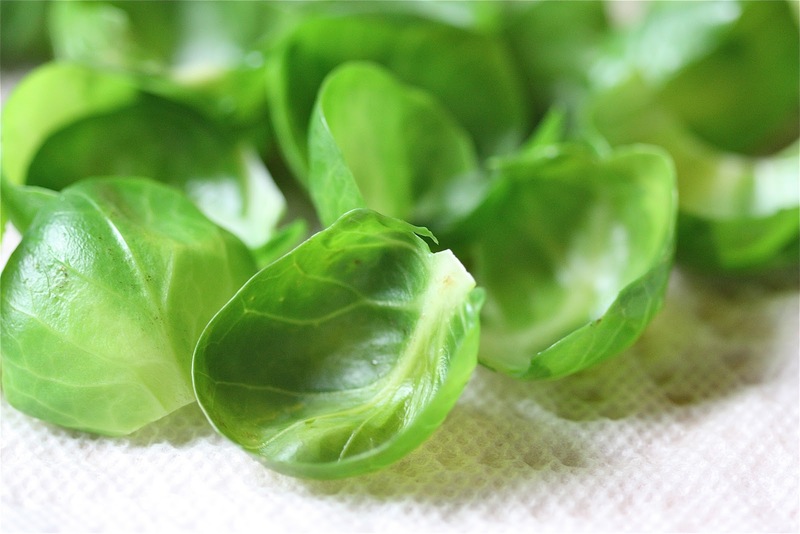 Cut and remove ends of brussel sprouts. Doing so will release some of the full, outer leaves... which you need to set aside for a quick blanch later. They'll add a lovely pop of color and hint of freshness to the final plating. Then slice each head in half... and then each half into thirds or quarters to get little wedges. (This slicing is what produces those leaf bits that get charred so beautifully when roasted.) 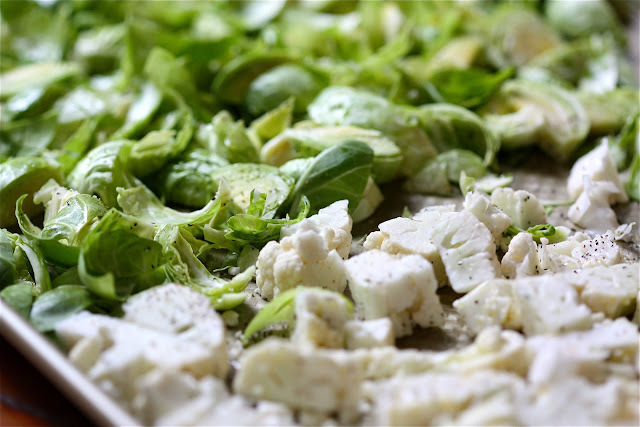 Once sliced, transfer veggies to one side of a large baking sheet, leaving room opposite to add cauliflower. Pop the veggies into a hot oven (425 degrees) for about 15 minutes, until golden brown and slightly charred. Remove from oven and set aside to cool. Meanwhile, blanch the brussel sprout leaves you held aside earlier (in a pot of salted boiling water)... for just about 30 seconds. Remove to a paper towel to drain. Supreme one large blood orange (over a small bowl to catch drippings). Cut supremes in half and set aside. Squeeze remaining membrane over bowl to release additional juice. Do the same with all the peelings from the orange to gather as much juice as you can. Ideally you'll want about two tablespoons. 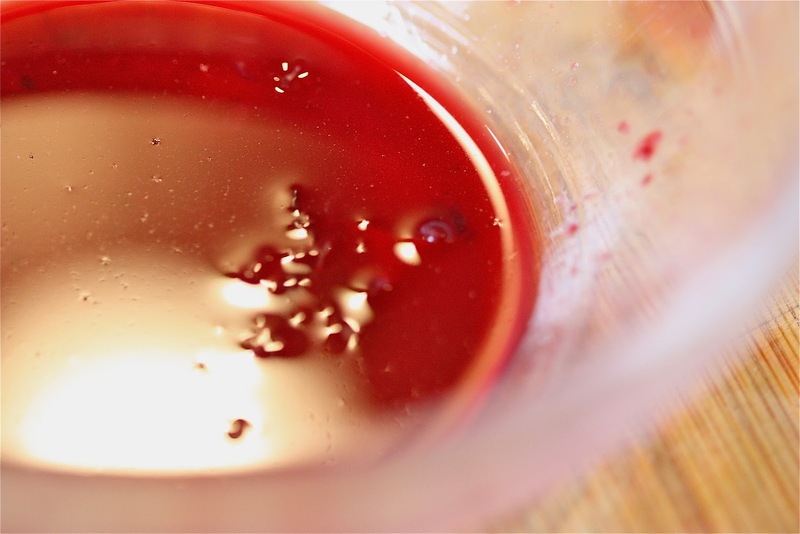 Mix in a bit of tamari, extra virgin olive oil, and a touch of champagne vinegar (I used a pomegranate variety). Season with just a touch of kosher salt and ground black pepper, to taste. Combine roasted veggies, blanched leaves, and blood orange supremes. Dress with vinaigrette and serve. The dish that inspired this post included tofu and bits of tomato (canned, best I could tell). Both were wonderful additions, but the salad presents just as well as noted here. The dressing is very close to that used in the plating which inspired this... and not to be skipped. Refer to posting for details on preparation.